How much does it cost to travel to Izmir? How much money will you need in Izmir? TRY102 ($18) is the average daily price for traveling in Izmir. The average price of food for one day is TRY13 ($2.18). The average price of a hotel for a couple is TRY160 ($28). Additional pricing is in the table below. These average travel prices have been collected from other travelers to help you plan your own travel budget. Izmir is a metropolitan city of Turkey and the second most populous city on the Aegean Sea after Athens, Greece. Known as Smyrna in antiquity, it was founded by the Greeks, taken over by the Romans, and rebuilt by Alexander the Great before becoming part of the Ottoman Empire in the 15th century. Most remnants of this past are gone; however, there are a few archaeological sites in addition to beaches, bustling city streets, and colorful markets. Izmir's lack of historical sights is due to a Great Fire that occurred in the 1920s. There is, however, plenty to see and do during a visit to the city. The archaeological site that does remain is called the Roman Agora of Smyrna, now an open-air museum. The hilltop Kadifekale, or Velvet Castle, is also worth a visit. Built during Alexander's reign, the castle, named after the hill upon which it sits, overlooks the city. Other views of the city can be had from the Asansör (or Elevator), which operates by electricity to the top of a hill with a restaurant offering panoramic views, while the Teleferik cable car can also bring people to the top of a hill with restaurants, cafes, and gift shops. Nestled on the coast of the Aegean Sea, the city is also in close proximity to many beaches not far from the city center - most of which can be reached via public transportation. Beaches can be found in the towns of Foca, Dikili, Urla, Seferihisar, and Cesme. As far as markets go, the Kemeralti bazaar is one not to be missed, stretching from Konak Square through to the ancient Agora. The market dates back to the 17th century and is home to shops, eateries, artisan workshops, mosques, coffeehouses, tea gardens, and synagogues. It is easy to get lost in the labyrinth of activity, but a wonderful experience for those hoping to be fully immersed in the city's culture. Izmir is a metropolitan city of classical antiquity, though most of the historical remnants have been lost to time. The main square of the city center is called Konak Square. 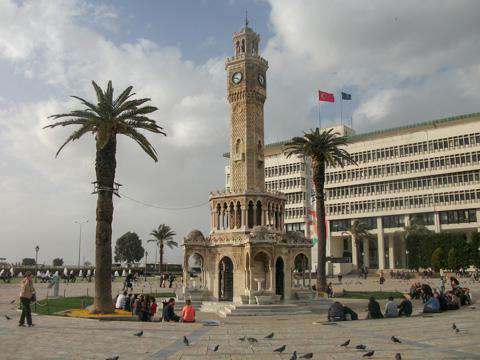 It features a clock tower built in 1901 which is now a unique landmark of Izmir. Also located around the square are the Konak Yali Mosque and Kemeralti Bazaar. Alsancak is another part of the city with small streets and a lot of bars in old Ottoman era houses. Also well-frequented is Karsiyaka, meaning "opposite side" as it sits opposite the Gulf from Konak and Alsancak with great views of both. This area also offers lively nightlife and one of Izmir's main pedestrian shopping streets. It can be reached via ferry or IZBAN (a suburban train line). There is also a waterfront promenade, called the Kordon, lined by rows of tall apartment buildings and palm trees on one side and the Aegean on the other. The area features a large patch of lawn and a cobbled street in between, where visitors can experience a 19th-century fayton (horse-drawn carriage) ride. Exploring the city sights, getting lost in the bustle of local life, and exploring the lively markets of Izmir is how many visitors occupy their stay in the city. The nearby beaches also offer quiet alternatives to the city for peaceful destinations on the Aegean Sea. Cuisine of Izmir is a reflection of its multicultural history, especially of Mediterranean influences. There are plenty of seafood dishes including items like shrimp, crab, scallops, and squid. These are often served in the form of mezes, or a selection of small dishes served to accompany alcoholic drinks, usually at the beginning of multi-course meals. Other meze dishes include a mashed eggplant called Mutabbal or Babaghanoush, hummus, falafel, halloumi cheese, souvlaki, yogurt, flatbread, tzatziki, calamari, and many more. There is also a rich selection of fresh vegetables, plenty of cheeses, and a variety of fruits like plums, apricots, pomegranates, pears, apples, grapes, and figs. Generally, ingredients in Turkish cooking include lamb, beef, rice, fish, eggplants, green peppers, onions, garlic, lentils, beans, zucchinis, and tomatoes. Olive oil is also a staple. As far as local specialties go, boyoz (usually plain) and lokma (deep fried and soaked in syrup or honey) are pastries associated with Izmir. The best way to enter by air is via Adnan Menderes Airport located 16 kilometers south of the city center. There are several daily flights to Istanbul, Ankara, and Antalya, as well as regular flights from many European cities. Airport shuttles operate to and from the city center, though public buses are also available. Izmir also has two railway stations: Basmane in the city center serves regional trains and the Metro, and Alsancak in the north serves intercity trains and the IZBAN. Public ferries and taxis also offer transportation around the area.